(Nanowerk News) Scientists are reporting development and successful testing of the first self-propelled "microsubmarines" designed to pick up droplets of oil from contaminated waters and transport them to collection facilities. The report concludes that these tiny machines could play an important role in cleaning up oil spills, like the 2010 Deepwater Horizon incident in the Gulf of Mexico. 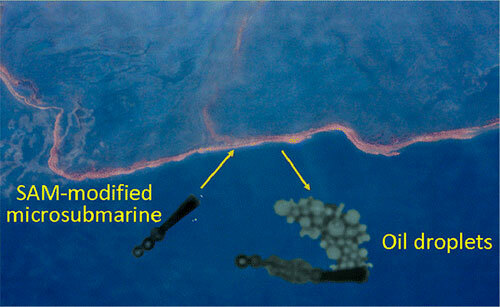 It appears in the journal ACS Nano ("Superhydrophobic Alkanethiol-Coated Microsubmarines for Effective Removal of Oil"). Joseph Wang and colleagues explain that different versions of microengines have been developed, including devices that could transport medications through the bloodstream to diseased parts of the body. But no one has ever shown that these devices — which are about 10 times smaller than the width of a human hair — could help clean up oil spills. There is an urgent need for better ways of separating oil from water in the oceans and inside factories to avoid releasing oil-contaminated water to the environment. Wang's team developed so-called microsubmarines, which require very little fuel and move ultrafast, to see whether these small engines could help clean up oil. Tests showed that the cone-shaped microsubmarines can collect droplets of olive oil and motor oil in water and transport them through the water. The microsubs have a special surface coating, which makes them "superhydrophobic," or extremely water-repellent and oil-absorbent. "These results demonstrate the potential of the superhydrophobic-modified microsubmarines for facile, rapid and highly efficient collection of oils in oil-contaminated water samples," say the researchers.